New York cracked winshield usage is governed by the state's Code. All relevant laws, rules and regulations pertaining to cracked windshields and windows in New York have been provided below. Make sure to examine the regulations carefully and repair your window cracks or replace cracked windows. Obstructed windshields, cracked windshields, windshield replacement and other laws and regulations are different for every state. Cracked windshield laws in New York prohibit driving vehicles where driver’s view of the road is obstructed. Can I drive with a cracked windshield in New York? New York laws prohibit driving with windshields which have cracks, chips, discoloration or other defects that impair driver’s view of the road. No stickers or other objects may be attached to car windshields which prevent clear view of the road either. It is up to each individual police officer to determine if your view of the road is impaired or obstructed. It is recommended to repair cracks or replace windshields immediately. Obstructed windshield regulations: No sign, poster, or other non-transparent material allowed on windshield unless required by law or DMV. Windshield insurance: Insurance companies may offer policies with no deductible window replacement. Our information about New York cracked windshield laws was last updated in 2018 and checked in 2019. In case any info we provided is not up to date or correct be sure to contact us so we can revise it. Thank you! Check our data with your local law enforcement or other relevant agencies! New York cracked window laws or windshield obstruction regulations in certain cities or counties may be different from state legislation. While we do our very best to advise whether it is legal to drive with cracked windshield, we can not be held liable for any potentially incorrect or misinterpreted info. Very often it is up to individual police officers to determine if your clear view of the road is obstructed. New York is a state in the Northeastern region of the United States. New York is the 27th-most extensive, the 3rd-most populous, and the 7th-most densely populated of the 50 United States. New York is bordered by New Jersey and Pennsylvania to the south, and by Connecticut, Massachusetts and Vermont to the east. The state has a maritime border with Rhode Island east of Long Island, as well as an international border with the Canadian provinces of Ontario to the west and north, and Quebec to the north. 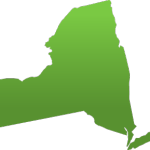 The state of New York is often referred to as New York State to distinguish it from New York City. Have questions about cracked windshield or other traffic laws in New York? Avoid high legal fees and ask local New York lawyers from the comfort of your home! Traffic law experts are on call 24/7 ready to answer and explain any question you have.